Checking a bag for travel? Think again! Carrying on a bag makes life so much easier with no lost luggage, no waiting, and no hassle. If you know that your final destination will allow you to do laundry there, you can simply pack for a few days and wash clothes as you go. Bring items that you know you can layer. Sometimes it's easier to pack most clothes in one color, like black or grey, and bring accent pieces for a pop of color. Shawls, shoes and jewelry work well to do that. 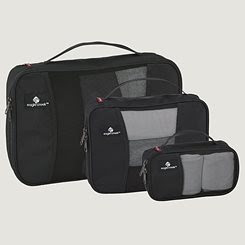 You could also use packing cubes/bags, like these from Eagle Creek. It is a great way to condense clothes to save room in luggage. Less can be a more a lot of the time. Think about what you’ll actually wear, not what you think you’ll wear. Be realistic. Don’t over pack, especially if you think you’ll be bringing souvenirs or extra items back. Save space by leaving shampoos and conditioners behind; hotels will have those to use. Leave the hairdryer home, as well. The small spaces in your suitcase are great for stuffing socks and rolled up belts. Rolling your clothes really helps create space, up to 20% more space! You can also stuff your socks into your shoes to save space! Ladies – if you choose dresses, especially if you’re going to a warmer location, you’ll end up saving much more space than if you packed a top, bottom, and a belt to go with. Shoes? I recommend taking no more than 3 pairs of shoes – one pair of dress shoes, one pair of casual walking shoes, and one pair of sneakers. Generally, you won’t need more than that.